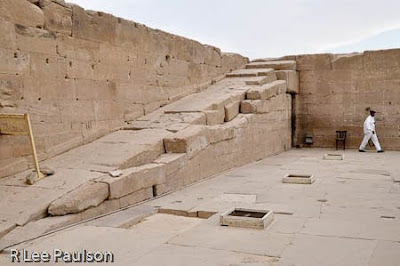 Once on the roof of the temple, they waited until just before daybreak and then took the statue of Hathor up this ramp (in the photo above) so that she got to the top, and had had her coverings removed just as the first rays of the sun crested over the horizon. 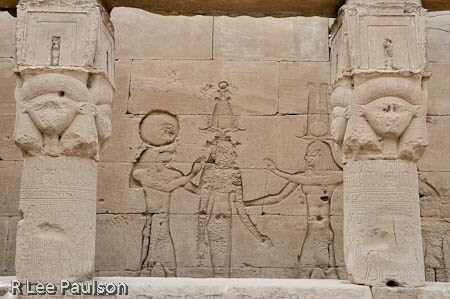 This was done, according to texts on the walls, so that "Hathor could be reunited with the beams of her father, Re." At that moment, the new year officially began and the crowd cheered. I'm thinking it was a similar ritual as having the ball fall in Times Square at midnight--the difference being that this ritual was rich with mystical symbolism. But, it does show just how far back into antiquity that new year's celebrations go. Notice the same type of irregular paving on the roof as we've seen elsewhere. I'd love to know the reason behind this. Ease of construction was clearly not part of their thinking. The roof of the temple has several small chapels and lots of carved figures, as one can see below. Most of which have been wholly or partially erased. I was amazed a just how carefully the stayed inside the lines. It was that way everywhere, too. Inside one of the chapels, is the only known carving where the ancient Egyptians have carved all 12 of the zodiac signs in one place, represented in circle, actually, a spiral. Scholars have claimed for years that the ancient Egyptians had no knowledge of the precession of the equinoxes, from which the signs of the zodiac actually originate. Precession of the equinoxes, for those who are unfamiliar with the term, relates to the illusion that the stars in the sky seem to revolve around us. If one sights over the horizon each year just before dawn on the spring day, typically March 20, 21, when the day and night are of equal length, one can measure the rate of the rotation. It takes approximately 25,950 years for the earth to make a complete revolution. The ancients called this a great year. Here is a photo taken with my camera with its back on the ground of the representation of the zodiac in the ceiling of the rooftop chapel. This, by the way, is only a copy. The original is in the Louvre. This is a plaster caste of the original. Why they painted this plaster copy black to match the smoke damaged ceilings of the rest of the chapel, we will never know. The original, now in the Louvre, has been carefully cleaned of most of its smoke damage. 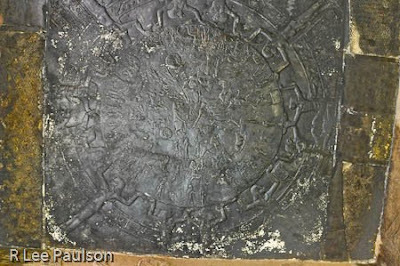 Unfortunately, it's just as difficult to make out the symbols in this image also. 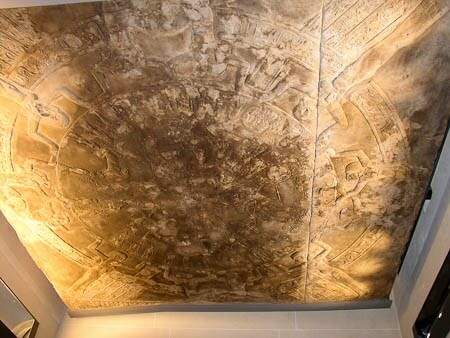 For some reason, it never occurred to me to lay the camera on its back in Paris as I did in Dendera. One of the huge areas of West's disagreement with traditional Egyptian scholars, revolves around the ancient Egyptians supposed lack of knowledge of astronomy. 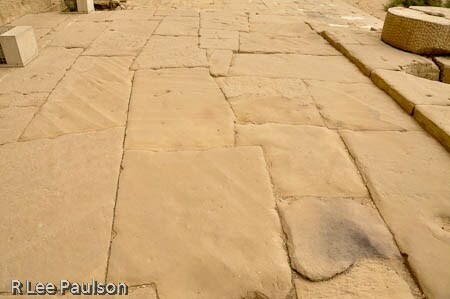 Scholars claim the idea of the precession of the equinoxes came from the Greeks and that it was the Greek influence in the region when this temple was built around 100 BC which caused this zodiacal representation to be placed here. If only things were that simple. We know, for example, that the number 72 appears in lots of ancient myths, not just ancient Egyptian myths. 72 represents the number of years that it takes the earth to travel one degree in a great year. Multiply that by 360 and one gets an idea of how long the great year is. Looking out from the roof where one can see the remains of the massive mud brick wall that surrounded this temple. 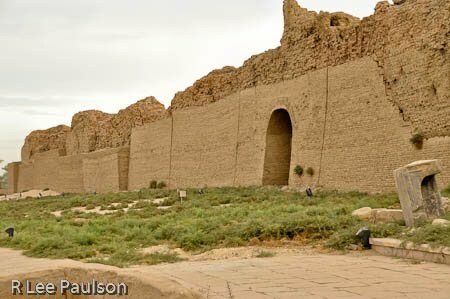 The amount of work involved in building that wall was, in my opinion, much larger than building the temple itself. Considering the main component of that wall is mud, which liquefies in the rain, these walls are in very good shape for being just over 2,000 years old. The scholars also claim that priests with competing deities fought over which of the deities would be more prominently worshiped. They have no evidence for internal priestly quarrels, what they do have is evidence of temples being closed and others opened. 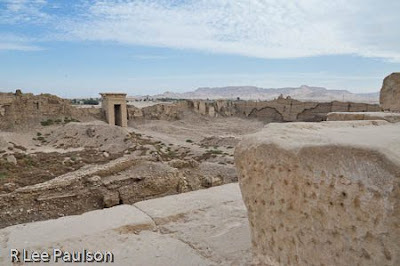 However, if one looks carefully at the time periods in which some temples were shut down and others opened, one finds that the time periods coincide perfectly with changing of the ages in the great year. Each age if we do the math comes out to be slightly over 2,000 years. The sphinx is a lion, the sign of Leo. The age of Gemini came next. 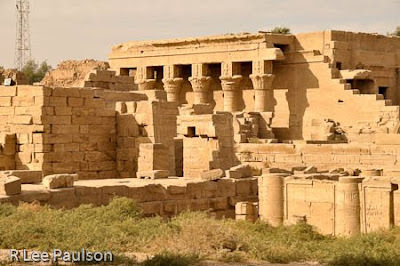 No evidence has been found of Egyptian civilization during the age of Gemini. But we do know they 'worshiped', acknowledged more accurately, the bull, Taurus. Then they venerated the Ram during Aries, then the fish during the age of Pisces. We have just exited the temple from the door above, under the watchful stare of the ticket takers. I don't envy their jobs. I'd be bored stiff. Now, some of the biblical stories symbolism begins to make more sense. Most of the symbolism in the old testament is about sheep, we had sheperds of the 'flock' and so on. That made sense because those events occurred during the time of the Ram, Aries. Then, the epoch shifted into Pisces, the fish, just as Christianity took hold. We have the new testament being all about fish. The symbol of Christianity is the fish, fishers of men, and the like. We are coming up on another epoch shift into the age of Aquarius now. This type of symbolism goes so far back into antiquity that it seems ludicrous to believe the ancients had no idea about the idea of precession. Interestingly enough, the story does not end there. We currently believe that precession is caused by a 'wobble' in the earth's axis. We believe that because Newton said so. There is a problem, however, with Newton's theory. One is that he never quite backed up his theory with the proper math. Notice the various efforts to fix the huge wall around the complex that have been made over the years. Another problem is that the only way mathematicians have been able to make the calculations come out right is to insert a constant into their equations. That would be fine except that the 'constant' has been changing over the last 300 or so years since calculations have been made. There is another problem with the Newton's idea of the earth wobbling on its axis. That is the planets in our own solar system should also precess. But they don't. In recent years, it has been suggested that the real cause of precession is a result of the earth being in a binary orbit with another star or stars. I was at a conference a while back where a mathematician looked at the way Newton's constant has been changing over the years. He claimed that the numbers suggested an elliptical orbit. Obviously, 300 years worth of data in a nearly 26,000 year cycle is not a lot of data upon which to base an conclusion. Still, it is an interesting conclusion. Notice how the wall, especially to the left of the arch, seems to sag. That, believe it or not, was intentional. We'll see other examples of this later. West claims the walls were made to look like 'waves'. Again, more symbolism created at huge additional expense for construction. There is a problem with the binary star idea as a cause of precession that needs to be pointed out. According to our known laws of gravity, Sirius is too far away from us to be our only binary star and there are no other known stars in the sky who might be candidates for our binary partner. Though, massive dead stars still exit out in space, it could be one of them, possibly, but there is no definitive proof to this theory either. Still, it is interesting to note that the there is only one star in our sky that does not precess and that is Sirius. It's also interesting to note that the ancient Egyptians venerated Sirius--as did many other ancient cultures. It was the most important star in the sky for the ancient Egyptians. They associated it with Isis, who we now know was the wife of Osiris Clearly, the ancient Egyptians knew far more about astronomy that modern scholars are willing to give them credit for. 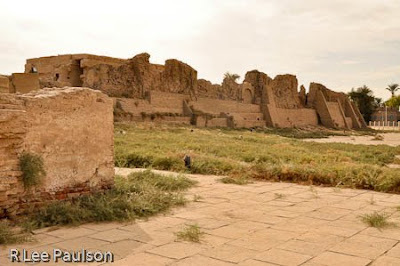 Much of the area around the inner perimeter of the temple's mud brick walls is in ruins. West claims that various types of healing took place here. West claims that the different temples in Egypt all focused upon different aspects of different 'gods'. Interesting how universities in our own age are sometimes called temples of learning. It's perfectly reasonable for us to send young 'priests' to MIT for engineering and others to Harvard for becoming MBA's. 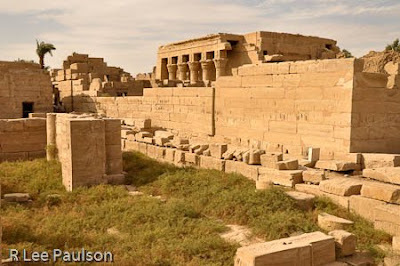 I'm wondering if we might relate to the idea of the ancient temples better if we thought of them more like we do our own modern 'universities' in many respects. There is, for example, a tribe of people living in Africa, approximately 3,000 miles west of Egypt, called the Dogon whose language, and symbols are similar to those of the Egyptians. They also venerate Sirius--and have for the last 5,000 years. 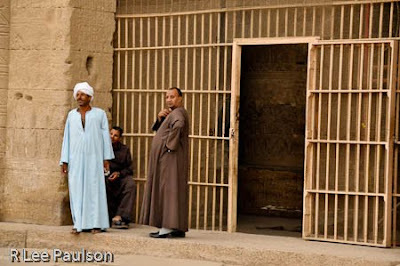 Unlike the ancient Egyptian language which is dead, their language is very much alive and still spoken today. Laird Scranton has studied the relationship between the Dogon and ancient Egyptians in depth and has found many interesting similarities. The interesting part for me, as it relates to this discussion, is that the Dogon tribe is a so called 'primitive' people. They have no modern instruments, such as telescopes, yet they have known for thousands of years as part of their oral tradition that Sirius is itself a binary star. They have known long before we (modern man) did that Sirius is really two stars orbiting around each other. Modern man has only known about this since 1844. Another shot of the temple ruins. Notice, if you look carefully, how each of the 5 visible columns above are all different in their patterns of decorations at the top. Actually, the Dogon claim there are three stars orbiting together in the Sirius system, something we have only begun to suspect since 1995. Without telescopes, how did the Doggon know this and who might have told them? And if the Dogon knew, did the ancient Egyptians know also? Could it be that a far older civilization taught both the Egyptians and the Dogon back before recorded history? That's possible, too. And that theory also has its adherents. Bottom line to all of this: The more one digs into the subject of the ancients (still only scratching the surface) and what they knew verses what we think we know, there always seems to be far more questions than answers. Next time, we lighten up a bit. You might have thought that would never happen. Continue on to Post 24: Up, up and away by clicking here.